Journalist Rob Ferguson provides a better timeline for the four refurbishments in Ontario Power Generation to spend $12.8 billion refurbishing four Darlington nuclear reactors. OPG chief executive Jeff Lyash said the Crown utility will take 40 months to fully refurbish the first of four reactors before doing the three others to work out any bugs before the bulk of the work is done. This all indicates only one, of 10, refurbishment projects is likely to start prior to 2019. The good news for the nuclear industry in Ontario is it can deliver the majority of electricity in the province for decades to come - if it can deliver on its estimated costs for refurbishments, and most importantly its next refurbishment which we now know will be at Darlington. It's good news for consumers if the industry does deliver. Power from both sites is not to be expected to be noticeably different after refurbishment than it is today. It's also not terrible news for consumers if it does not. Both the Bruce and Darlington contracts have "off-ramps." Chiarelli said there are no kill fees to the dozens of southern Ontario contractors involved in the project if it is cancelled but that some provisions would be subject to arbitration. The pressure is on OPG to deliver on its costing, but the impact goes well beyond OPG, to a broad supply chain that will service all refurbishments of reactors. There are multiple implications if everything announced goes as planned. The surplus may become less of an issue if coal-fired generators in the United States continue to come off line, and, particularly, if reduced drilling activity sees a recovery in natural gas pricing. I wrote in April 2015 on the pace of refurbishment negotiations, and at that time I examined the effective full-power hours (EFPH) of Ontario's reactors. The Bruce B reactors have far more hours producing power than Darlington's, but I suspect due to contracting it makes sense to use a Darlington reactor to establish the financial feasibility of refurbishment. I also read one nuclear critic claiming refurbishments were occurring far earlier than planned during the original build period of the reactors. I was skeptical of this, as the EFPH allowed of the reactors was only recently changed from 210,000 to 245,000+, so I revisited the final annual report from Ontario Hydro before it was disbanded (OPG is one successor). It displayed the change in anticipated refurbishment periods over the final three years . Three of Darlington's units will be refurbished as planned in 1997, and one prior to that. Bruce units will operate far longer than anticipated in 1997, and a decade beyond the lowered expectations of 1999. 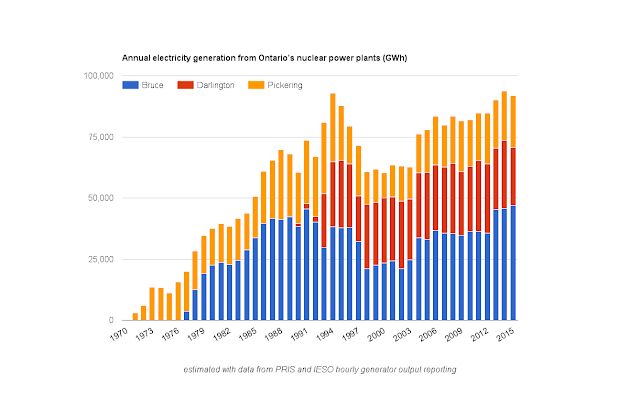 I found it interesting the nuclear generation assets were devalued by shortening the anticipated period to refurbishment between 1997 and 1999 (contributing to a "stranded debt"), but more interesting the operational improvements that have recently seen most of the highest production years from Ontario's nuclear generating assets. With the refurbishment announcements of the past 6 weeks, I am far more hopeful of a reasonable cost, low emission electricity sector in my province for decades to come - but I'll temper my optimism until the first Darlington refurbishment indicates it is delivering on the promises of an industry.